If you’ve been listening to the So You Want To Be A Writer podcast, you’ll know that Val and I are both fans of musical theatre. 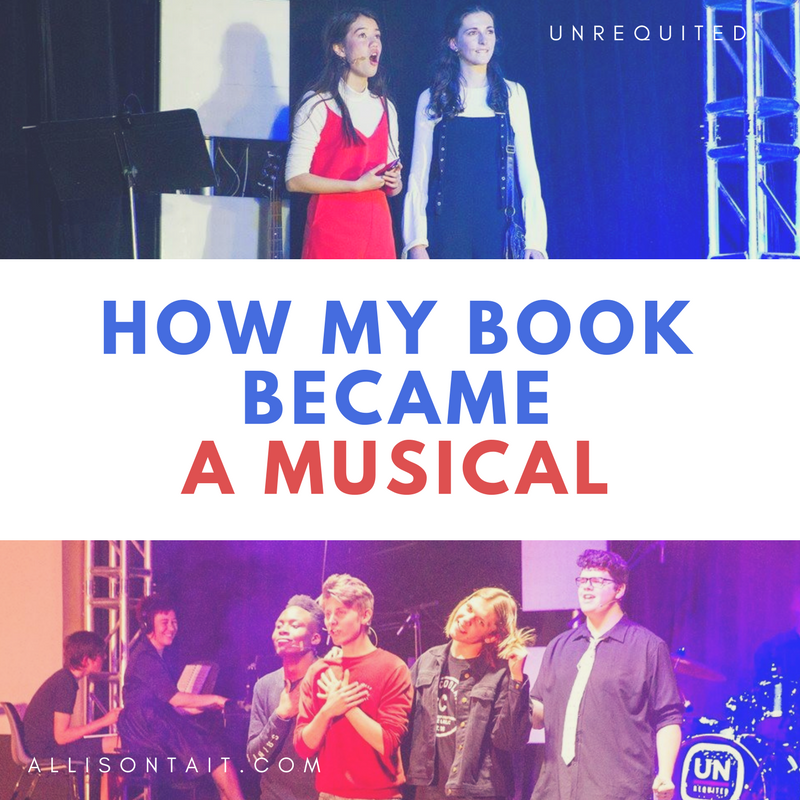 She never misses an opportunity to drop Hamilton into the conversation, while I… well, you can read about the time I randomly auditioned for a musical here. 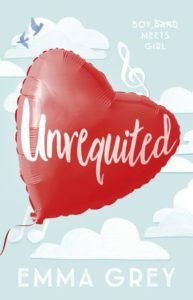 So when my friend (and author) Emma Grey began posting on Facebook about how she was working with fabulous ARIA-award-winning composer Sally Whitwell to turn Emma’s YA novel Unrequited into a musical, my ears pricked up and I watched the process unfold with great interest. 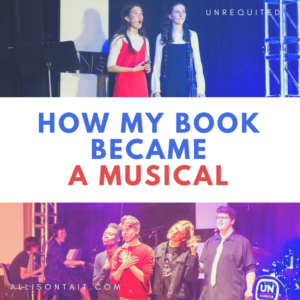 The musical was staged for the first time in Canberra a few months ago, to great reviews, and so I asked Emma and Sally to write a post to bring together all of those Facebook updates and share with us exactly how one goes about turning a novel into a musical. And here it is. It’s a long one. You’ll need a cup of tea. And maybe a feather boa. Ideas for novels hit in the strangest of places. Four years ago, I was sitting in a One Direction concert in Sydney with my then 13-year-old and her sister, enduring the piercing squeals of 20,000 screaming, infatuated fangirls. I imagined what would happen if you were a teenager dragged to a concert like that against your better musical judgement. My daughter hated reading, but loved boy bands, and I wondered how difficult it might be to merge the two. It seemed the ideal way to show her that reading could be fun, while creating a contemporary romantic story populated by strong and driven female characters who can fall in love without losing their minds. Unrequited was self-published in 2014. Shortly after, it was picked up by a literary agent, Anjanette Fennell, who sent to 17 publishers before HarperCollins offered a two-book deal in 2017. One of the earliest reviews of the book was from my childhood friend, duel ARIA-winning composer, Sally Whitwell. ‘This has got hit Broadway musical written all over it. All. Over. It!’ Sally wrote, in what we hope will one day become a prophetic observation. Sally took the story and set it to some unforgettable music and we had our first workshop at St Clare’s College in Canberra this year under the expert direction of our new friend and fellow hare-brained schemer, Vanessa Johnson. Our first review described the show as ‘a glittery, loud, proud and completely unique musical extravaganza: think cleverly worded boyband numbers, beautifully orchestrated ballads, hilariously vain pop star numbers … and heart-wrenching duets that wouldn’t be out of place on Broadway’. 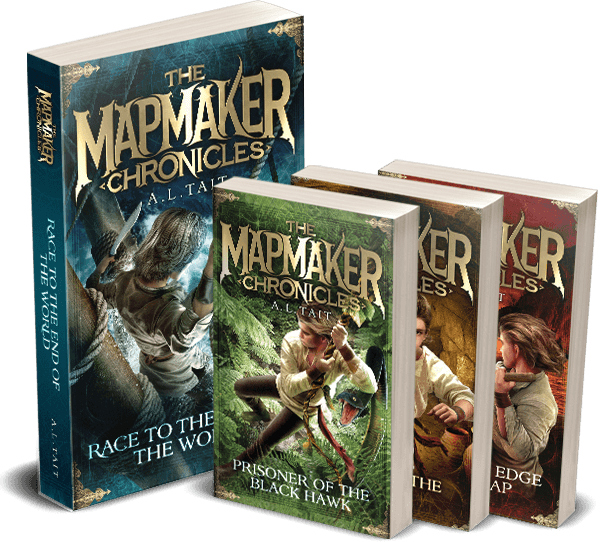 While we work towards the Broadway goal (beginning with finding the next Australian high school to stage it), I’ve just completed the first draft of a sequel, with visions of a six-part series. The draft had barely left Google Docs and landed in Sally’s inbox before she’d uploaded two new songs into the cloud, beginning the creation of our second musical. Sally had initially received advice from her peers to ‘scale down’ the concept of the show to fit the small venues and ensembles that would be easier and more realistic for us to arrange … so we promptly ignored that advice and scaled it up. We envisage the show/s in numerous guises, from an abridged ‘Unrequited Junior’ and low-budget high school musicals through to national and international touring versions, the West End, Broadway and even a Schools-Spectacular-esque stadium performance with a cast of thousands. Then there’s the movie-musical adaptation we’re imagining, the merch, the reality TV ‘search for the stars’ idea, the ‘making of’ documentary, the songwriting scholarship for young women that we’d love to establish once this all takes off … and all the other ideas we just haven’t thought of yet. This has never been ‘just a book’. It began to light the imagination of my daughter, and somehow caught fire in our grown-up imaginations. For different and deeply personal reasons, this project has seen both Sally and I through some of the most difficult and fraught experiences of our lives. We all need a little more fun and light and hope in our world, and the Unrequited project has become our way of contributing some of that light. We’re quite in love with the story, the collaboration and the dream. Who would have thought, 30 years after meeting each other in our high school ‘home room’, that Emma and I would be here having collaborated on a musical about a boy band? Certainly not me! In my teens, I was so busy practising Debussy on the piano, and Mozart on the bassoon, that the concept of the Boy Band pretty much passed me by completely. I preferred Bach to the Backstreet Boys, Rachmaninov to Rick Astley, the New World Symphony to New Kids on the Block. Fast forward to 2014, I sat down on my couch with a cuppa and a biscuit to read Emma’s novel Unrequited: Girl Meets Boy Band. My coffee went cold, my biscuit went soggy, so engrossed was I in this wonderful story for which I am absolutely, positively, definitely NOT the target audience. I immediately messaged Emma begging her to allow me to adapt her story as a stage musical. She informed me that it was a movie, not a musical. I set some of the lyrics in the book to music, recorded it on my phone and sent it to her. She liked the song, but again she told me it was a movie. Stubbornly, I wrote a tune for yet more of the lyrics in the book. It seemed to do the trick. She finally said yes to the musical idea. We decided to tackle the adaptation together. Thence followed what we now fondly refer to as The Great Summer of Writing. I was struck down by the worst bout of laryngitis I’d ever had. Couldn’t speak at all for at least three weeks over Christmas and New Year. Instead of being miserable about being sick in summer, I spent those hours collaborating with Emma over google docs and dropbox at all hours of the day and night. We’ve since worked out that this is the best way for us to work. When we’re in the same room, we constantly dissolve into conversation but when we’re 300km apart, we work really intensely and productively. Go figure. I work with young musicians every day as an educator, so what thrilled me the most when I first read Unrequited was the message it sends to young women. 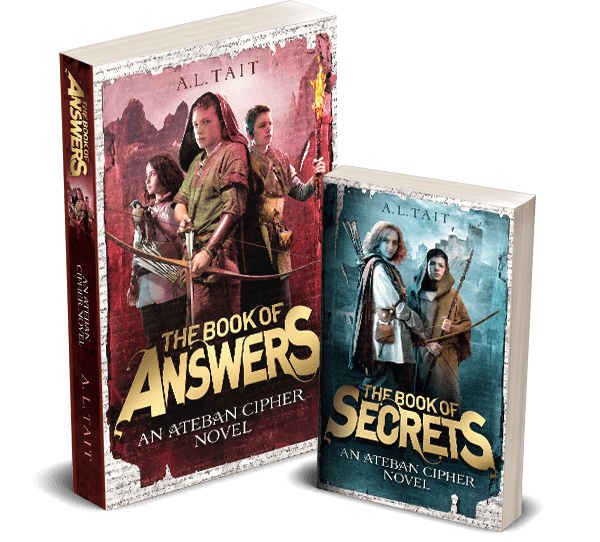 A book with strong but flawed young female leads, characters with whom a teen girl audience can immediately identify, taking full control of their futures. People regularly assume that I always knew exactly how my career would pan out, that I was always so certain, so sure of myself and my life in music. But it wasn’t actually that clear cut. I had a general idea that it would be music, but I didn’t know precisely how. Bassoonist in an orchestra? Accompanist? Teacher? Arranger? Composing didn’t come into my life until I was 35, so that career path wasn’t really open to me. It is plain weird that my writing life has taken a turn into both Boyband and musical theatre territory. I mean, I really kinda loathe both those things, or thought I did, but I can see now that I just didn’t like the way many other people do it. Best way to make things happen is to do them yourself! So here we are. Emma Grey is the Canberra-based author of Wits’ End Before Breakfast! Confessions of a Working Mum (2005) and the award-winning I Don’t Have Time, co-authored with Audrey Thomas (2017). Her debut teen novel, Unrequited, was published by HarperCollins in September this year, and she is in the final stages of writing its sequel. She is co-creator of the productivity program, My 15 Minutes, creator of WorkLifeBliss, and she has a weekly column in HerCanberra. Sally Whitwell is a dual ARIA Award winning composer and pianist based in Sydney. She has released four albums with ABC Classics/Universal (Mad Rush; The Good, the Bad and the Awkward; All Imperfect Things, and I Was Flying) and will release her first double album in February 2018, Completely Piano Etudes of Philip Glass. For some years, she has worked as principle accompanist for Gondwana Choirs with whom she has toured widely in Europe, Asia, and the Americas. Most recent compositions have included Face to the Sun, for the Acacia Quartet, Fatal Flaw by Ensemble Offspring. Find out more about Unrequited (book and musical) here.